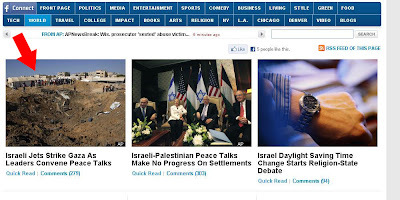 Huff-Watch: 9/15/10: HuffPost twists headline to incite hate against Israel, protect Hamas (again); predictable user hate-fest ensues; HuffPost: "Approved!!!" 9/15/10: HuffPost twists headline to incite hate against Israel, protect Hamas (again); predictable user hate-fest ensues; HuffPost: "Approved!!!" This afternoon, HuffPost provided more proof to validate our allegation that for more than three years, despite its repeated public claims that it is "nonpartisan" in its news coverage, and is dedicated to "ferret[ing] out the truth, consequences be damned," it is engaged in a "journalistic jihad" against Israel. In today's case, HuffPost deliberately turned the facts on their heads in order to clearly insinuate, in an inflammatory headline, that Israel attacked Gaza, and that it did so in order to sabotage peace talks. For two weeks now, HuffPost has been pathologically ignoring Hamas's savage terror attacks against Jewish civilians, and the heartbreaking stories of the victims of those attacks. HuffPost recently published and heavily promoted a fawning interview its Middle East correspondent conducted with a top Hamas terrorist. HuffPost downplayed, then ignored the fact that Lebanon (with suspected help from Hezbollah) assassinated a beloved IDF officer, and father of four. Wow, you mean Israel just decided to pulverize Gaza, as "leaders" convene peace talks? Really, HuffPost? Holy smokes! 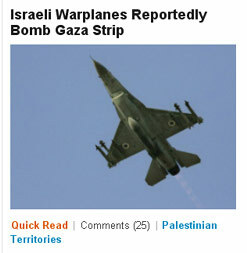 Israeli jets have attacked Gaza for no reason?! While the leaders are meeting for peace talks at that very moment?!?! This is an outrage! 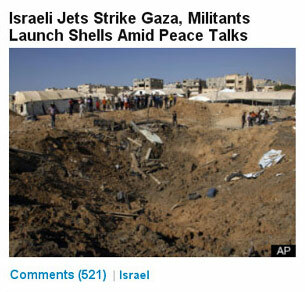 Israel clearly has no interest in peace! They'll do anything to destroy these fragile talks, those bastards! That is, until you actually read the article (something most HPers do not do). Let's see what it says, shall we? "Militants launched mortar shells into Israel and Israeli jets bombed targets in Gaza on Wednesday, just as Israeli and Palestinian leaders held peace talks in Jerusalem with U.S. Secretary of State Hillary Rodham Clinton. Gaza militants opposed to peace with Israel have threatened to derail the fledgling negotiations, and the Israeli military said eight mortars and one rocket hit Israel by mid-afternoon on the day of the talks – the highest daily total since March 2009. There were no injuries." Oh, there has been firing back and forth between Israel and the Gaza Strip today. The Gazans fired nine missiles into Israel, and Israel bombed a smuggling tunnel. How fascinating, that seems like the kind of information that should make it into the headline, it seems important. Indeed, Matt. 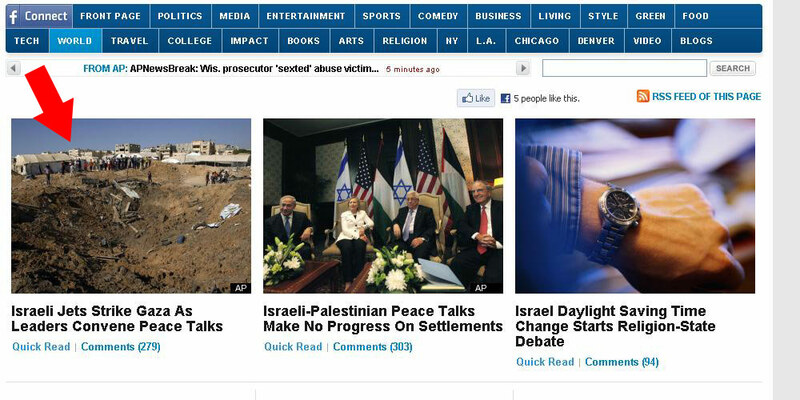 But HuffPost wasn't quite done inciting hatred against Israel on false grounds, for the day. Think about that one for a moment. "Israeli jets strike Gaza, militants launch shells..." According to HuffPost --- now a top ten American "news" site --- Israel struck Gaza for no reason, and then (unnamed) "militants" tried to defend themselves by firing shells. Israeli warplanes responded [to the mortar and rocket attacks by Hamas] by bombing a smuggling tunnel along the Gaza-Egypt border, the military said. So Israel was responding to these "militants'" (translation: Hamas's) rocket and mortar attacks with a retaliatory air strike. Got it. Gee, do you think Hamas might be ramping up to instigate yet another war against Israel? Well, if one only relied on the self-proclaimed "Internet Newspaper" for enlightenment, one would think that if war breaks out, it will only be because Israel started it. 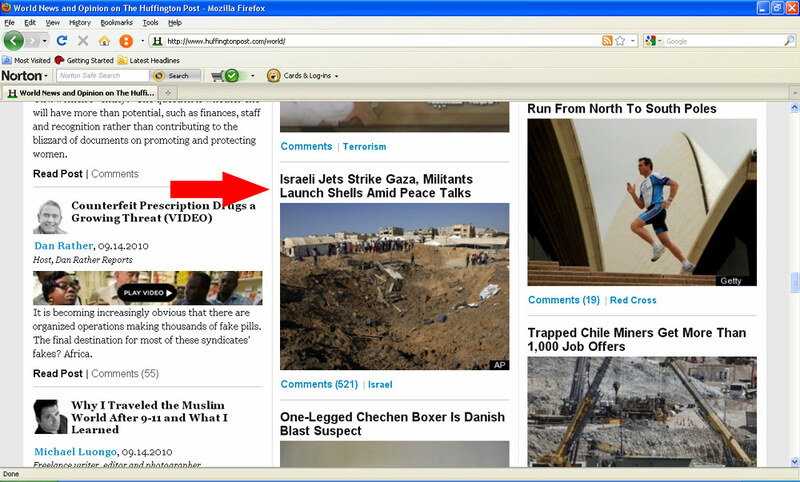 As documented here, in April 2010, HuffPost ran a front-page story entitled "Israeli warplanes reportedly bomb Gaza Strip." In reality, the IDF was responding to Hamas rocket attacks, and using precision guided missiles, took out several weapons factories in densely-populated residential area in Gaza, without killing a single civilian. As documented here, in April 2007, HuffPost did the same thing, with a story it entitled, "Israel fires missiles into Gaza." HuffPost's own story shows that it was responding to rockets being launched against its civilian areas --- but the way it played the story led to user comments such as, "Is there a Nation out there that will STOP the JEWS from killing innocent woman and children once and for all ? I just cant wait for the next Hollocaust, it will be faster and cleaner now that Seimens built a 500 seater Microwave Oven." See this archive for many more examples of HuffPost's incitement of hatred towards Israel through false or decontextualized headlines. If you're as outraged as we are at HuffPost's persistent incitement and tolerance of hatred against Israel, and would like to make your voice known to its senior management (politely, please), here's how. 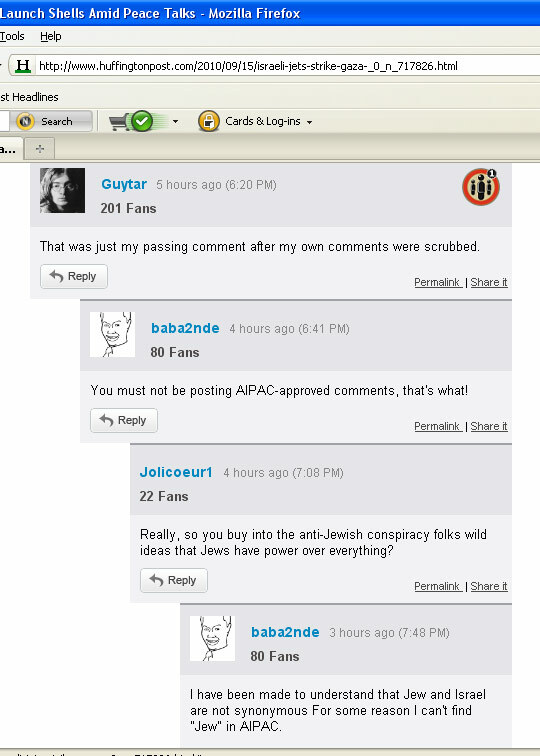 So what kind of user comments to you HuffPost reviewed, approved and decided to publish, in response to its incitement? Keep in mind that HuffPost's "Comment Policy" claims that it prohibits, and will not publish user comments anti-Semitic slurs or conspiracy theories. Right. Un-fu***ing believable ! Well the world is seeing who the real terrorist are in that region. What other country in that area is going around bombing other countries at will..
[...] The moment President Obama stipulates that Israel must withdraw it's occupation and the IDF protection from Palestinian territories, is the same moment that a social and economic solution/revolution will begin. [...] Historically, Israel has never alone, it will always follow the regulations of the USA, that's if the administration has the audacity to make the demands at all. Same old Israeli MO...bulldoze houses, provoke, provoke, provoke then when the militants are so mad they send a few rockets over that usually land in fields with no injuries..send in the fighter jets and get out the press releases of how they are picked on. [...] regarding dual citizenship, why does any American need another homeland? Isn't America enough? How can one be equally loyal to two nations when their interests will invariably conflict at times? This kind of "dual loyalties" is what gave us Jonathon Pollard. Really, so you buy into the anti-Jewish conspiracy folks wild ideas that Jews have power over everything? I have been made to understand that Jew and Israel are not synonymous For some reason I can't find "Jew" in AIPAC. 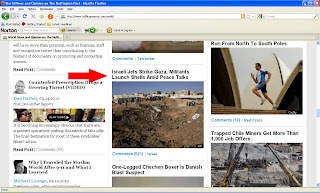 3/29/09: MSM starts backpedaling on IDF "atrocities." Will HuffPost?